Kizoa is an amazing Online based Movie Maker, Video Maker, and Slideshow Maker. Due to its availability, it is completely portable and can be work from any device from anywhere. You often search for separate software and tools to do your task for video Movie, Video, Slideshow and Photo editing but in Kizoa you will have all these tools in one. The Best part about Kizoa is that it has free plan also and it doesn’t cost you anything for using its features or tools as compared to other online tools. which are paid and sometimes cost a decent amount of money. Kizoa has really extensive features in Movie making tool. It includes cutting video into clips, applying special effects and transition also including audio along with video playing such as adding music with video to get really attractive video. Also, you can try some templates for different occasions such as weddings, graduation, birthdays, holidays, and much more. The Most usable tools in Kizoa is its Slideshow maker which has really awesome features and trusted by a lot of users. You can make a slideshow in 7 different formats (16:9, 4:3, 3:2, 1:1, 9:16, 2:3, 3:4). So it will be adaptable for any platform such as PC, laptop, TV, smartphones, and tablet. You can play it on multiple platforms. Share your slideshow online with your friends and colleagues. Download your Slideshow in a variety of formats such as MP4, AVI, MOV, MPEG2, and GIF. Add hundreds of different effects, text, and animations on your slideshow. With Dozens of templates including animated as well, to make your college look attractive. Edit them by adding text and special effects on them. Share your collage online with others. Transform your photo to different angles, make them landscape/portrait with ease. Add filters to your photos and add effects such as cartoon, watercolor, pop-art, mosaic, etc to show the unique work. Add different frames on your edited photos and make your photo border looks clean with each angle. Now, this feature let you use and kizoa in any system, whether it’s your friends, colleagues or public because you can store your edited work on kizoa cloud. 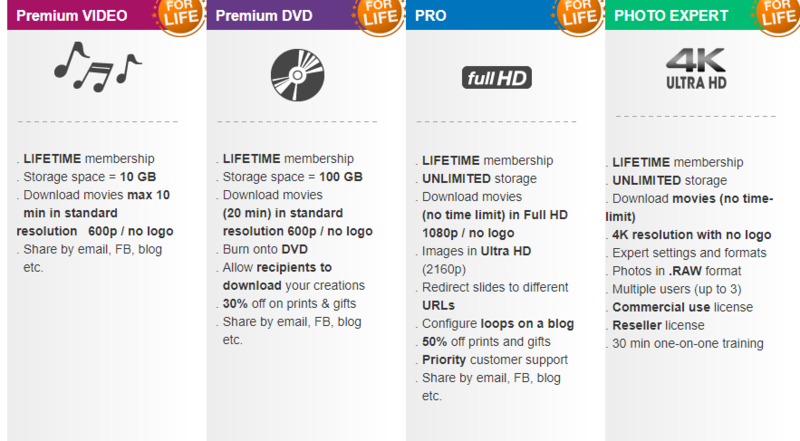 So that you can access your videos, photos and slideshow from any system. It helps you secure those edited work during any crisis like if your system got affected with virus then you may have lost this data but saving on kizoa cloud makes it accessible for every place and keep it safe always. If you purchase or choose from its four plans instead of the Basic plan then you are under its refund policy. So, in any case of a technical issue, they will refund you the cost of your plan that you have purchased. Overall Kizoa is an amazing online platform to provide Movie, video, Slideshow Making and photo editing. Give your reviews if you are a user of Kizoa in below, comment section.